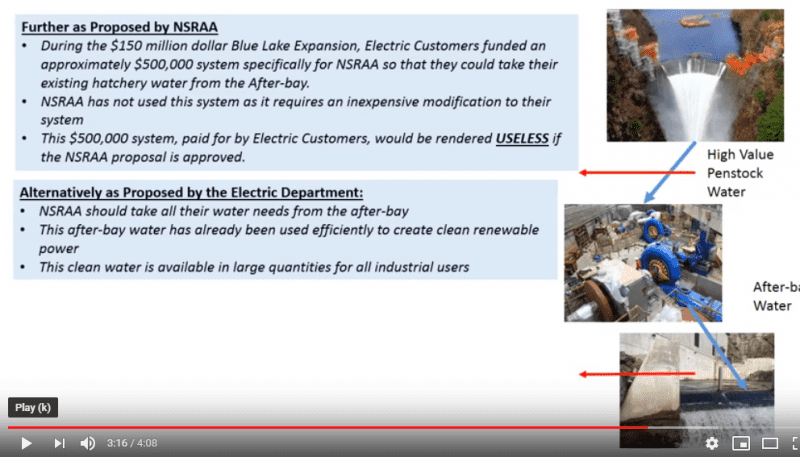 A screengrab from city utility director Bryan Bertacchi’s explainer video, where he argues that the NSRAA proposal could cost taxpayers more money. A Sitka hatchery is negotiating with the city over a new water agreement to expand its operations. But Sitka’s utility director says he’s worried the deal could drive up electric rates. The Northern Southeast Regional Aquaculture Association is in the midst of a $4 million expansion at the Gary Paxton Industrial Park. NSRAA it would produce between 500,000 and 2 million juvenile Chinook salmon annually. NSRAA’s general manager Steve Reifenstuhl says they’ll need water from Blue Lake. “Chinook salmon are a big water user because you have to keep them in raceways around ponds for roughly 18 months,” he said. NSRAA currently taps into Blue Lake for up to 6.4 million gallons of water a day free of charge. Under a proposal being presented to the Sitka Assembly, the max flow limit could double during peak hatchery production times. Blue Lake doesn’t just supply Sitka’s drinking water. Its hydroelectric turbine also produces the lion’s share of the town’s power. This draft agreement worries Sitka’s utility director. So much so that Bryan Bertacchi turned to YouTube on Thursday to lay out his concerns. There’s a lot of numbers there. But basically what he’s saying that if Sitka has low amounts of rainfall, crucial water needed for hydro power might instead go to the hatchery. He wants the hatchery to pump the water after it’s been through the turbines to generate power. Reifenstuhl says he’s not against the idea. As a long-term goal. But in the meantime he says the hatchery needs the water soon- they plan to get the new operation up and running by 2021. “We’re going to resolve the delivery system in the future. What we need is this water agreement,” he said. Droughts are hard to predict. But it has happened in Southeast. This summer low rainfall forced Ketchikan to turn to diesel to supplement its power generation. Reifenstuhl said he doesn’t see that happening in Sitka. Bertacchi, the utility director, said even a slightly drier season than last summer could force him to turn to diesel to supplement Sitka’s power grid. The National Weather Service recently announced a lower than average snowpack across Southeast Alaska. It said that could impact reservoir levels this summer. In the meantime, City Administrator Keith Brady is endorsing the plan. He says fears about it are overblown. Ultimately it’ll be for the Sitka Assembly to decide. They’ll have their first review of NSRAA’s proposal at the Feb. 12 meeting. They likely won’t hear testimony from Utility Director Bryan Bertacchi, though. He’s on vacation and out of town.